The notion of American empire may be useful propaganda, but it isn’t borne out by America’s current policy or by public opinion. Indeed, as recent debates within the United States over Syria clearly show, the danger for the world is not an America that is too eager to immerse itself in the affairs of other countries or to take on every problem in the region as its own. The danger for the world is that the United States, after a decade of war -- rightly concerned about issues back home, aware of the hostility that our engagement in the region has engendered throughout the Muslim world -- may disengage, creating a vacuum of leadership that no other nation is ready to fill. ... I believe America is exceptional -- in part because we have shown a willingness through the sacrifice of blood and treasure to stand up not only for our own narrow self-interests, but for the interests of all. Is this definition of American exceptionalism--a costly "willingness ... to stand up not only for our own narrow self-interests, but for the interests of all" -- consistent with the origins of the Christian teaching behind the original biblically-shaped model of American exceptionalism? A couple of years ago I tried to defend that original vision, pointing out its essential modesty and its clear warning that failure to live up to the demands of love and discipleship would prove disastrous for the new colony. Fast-forward from 1630 (the date of John Winthrop's famous sermon, "A model of Christian charity") to 2013, and what are we to make of the lower chamber of Congress slashing billions of dollars from food stamps and entertaining a systematic, lavishly-funded campaign of lies and half-truths to preserve the public from the blessings of health insurance reform? It is supposed to be the way we treat each other in this "city on a hill" that permits us any claim of exceptionalism or any basis for wider influence. 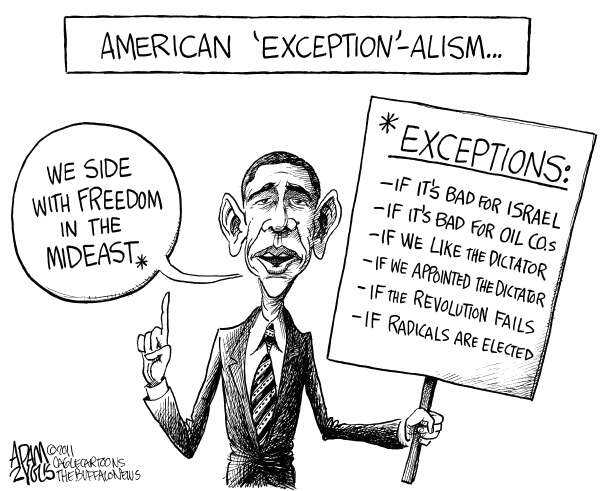 I'm not arguing that Barack Obama is entirely wrong in his General Assembly definition of American exceptionalism. In addition, I found his confession regarding American meddling in Iran to be helpful. I do believe, however, that it would be very consistent with the Winthrop's teachings for us Americans to do some very hard thinking about how exactly we define narrow self-interests (whose, and how extraterritorial are some of them, truthfully?) and who are the "all" whose interests we also claim to cherish? "The idea of exceptionalism moves in different ways--toward community or toward empire," says Marc H. Ellis in the latest addition to his excellent series of articles, "Exile and the Prophetic." As soon as the prophetic element enters into a group identity, says Ellis, you have exceptionalism. Christians are certainly not exempt: "I haven’t met a Christian or a Muslim who doesn’t believe somewhere in their psyche that Christianity or Islam is the place to be. It’s irritating for sure, no more or less than Jewish exceptionalism. It all depends from what side of the exceptionalism fence you view things." Nevertheless, Vladimir Putin asserts in his op-ed that "It is extremely dangerous to encourage people to see themselves as exceptional, whatever the motivation." This reminder, of course, applies not only to the United States, although the U.S. military budget, comprising as it does almost half of the planet's military expenditures, is a legitimate target for scrutiny. Holy Mother Russia itself, the Third Rome, is not immune from this danger. See Sean Guillory's article dated today, "Historical Lineages of Putin's Russian National Identity." Father, maybe from your vantage point at some remove from Russia [namely in England], you have a better view of the processes going on in our homeland's Church. ... Political conformism has long been one of the scourges of the Russian Church. Already before the Revolution, the Church and the state formed a sort of harmonious whole, which by the way didn't always work out to the benefit of the church. After the Revolution the church kept quiet. During the time of extreme repression and persecution, political expression was out of the question for everyone. And so now it will take an extended course of study -- actually more like an education by immersion -- before we'll learn how to think politically, speak politically, from inside the Church. No party at all should be able to claim the Church as its own, but at the same time the Church is not non-party, or above parties. She must be the voice of a conscience illuminated by the Light of God. In the ideal state, the Church must be in a condition to speak to any party, any movement: "This is worthy of humanity and of God, and that is not." Of course, this can be done from either of two positions: either from a position of strength, or from a position of complete helplessness. It seems to me -- and I'm deeply convinced of this -- that the Church must never speak from a position of strength. The Church must not be one of the powers operating in this or that government; she must be, if you like, just as powerless as God, Who does not coerce, Who only calls us and reveals the beauty and truth of things, but doesn't enforce them on us; Who, similarly to the way our consciences work, points out the truth, but leaves us free to listen to truth and beauty -- or to refuse them. It seems to me that this is how the Church should be. If the Church takes its place among those organizations that have power, that are able to force and direct events, then there will always be the risk that she would find power desirable; and as soon as the Church begins to dominate, she loses the most profound thing, the love of God, and an understanding of those who need salvation rather than the works of destruction and rebuilding. Now in the West as well as here [in Russia] we're hearing voices asserting that Russian Orthodoxy is once again becoming the state religion. What do you make of this assertion? I think that, thank God, we're a long way from that. It's one thing for the state to become convinced that a Christian, or in a wider sense believers generally (here I'm thinking about Muslims and Buddhists as well) can also be a loyal son of the motherland. But whenever any church represents the vast majority of believers, the relationship of this church and the state become, of course, more enmeshed and more complicated. And once again one of the tasks of the church -- whether we're talking about East or West--consists of not allowing itself to become part of the political or social system, but rather the opposite. While remaining fully loyal (in other words, wanting the best for the nation), warning society as a whole that there is another dimension to life, that there's not just the social-political dimension but that life has depth. Every country chooses some kind of expression to characterize itself, but this expression doesn't necessarily describe what is true now, but instead its ideals and aspirations. So France called itself la France très chrétienne; Germany insisted on deutsche Treue, German faithfulness; Russia constantly talked about Святая Русь, Holy Rus'. But here's the thing: if we ask to what extent Russia was actually holy, and to what extent was it in combat; if we ask whether Russia was entirely dedicated to achieving this holiness -- the answer is right there in Russian history, which provides a rare spectacle of inseparably mixed holiness and horror. Leskov's story "Deliverance" is a short, clear, vivid depiction of how things were: we see a man, a godly believer, but "the Devil only knows" what's in him -- I mean this literally, I'm not using swearwords. This man goes on raging benders, he's off to sow his wild oats, then suddenly returns to God before turning right around in the old direction. For Russian history, this is completely normal; it runs through our past like a red thread. The situation of adjunct instructors is getting some welcome attention, thanks to the sad story of Margaret Mary Vojtko, summarized here. Thanks to Lynn Gazis-Sax, here are "2 Tech Tools for Emergencies from our Westgate Experience: Ping and Blood Donation." Interview with Pope Francis, "A Big Heart Open to God," and a Russian Orthodox blogger comments. I am ripening some observations on my own, sparked by Francis's collapsing house of cards. Ralph Ellison, Randolph County, and Banned Book Week: right here. My beloved is "riding along on this big jet plane" to London, and I'm at home comforting myself with another clip from Ruf's Blues Caravan's 2012 visit to Denmark. Samantha Fish, Dani Wilde, Victoria Smith, Denis Palatin, all on one of YouTube's very best musical channels.